☪[FANTASTIC NOISE CANCELLATION]:Use high quality shield wire for both mic and extension wire, no static noise, works well outside when it¡¯s windy or you are walking, makes your voice sounds good.Suitable for Youtube, Skype, video conference, interview, popcast, video chat, sing and garage band. ☪[EXTRA-LONG EXTENSION CABLE]:Mic cord up to 5ft and with FREE 6.6ft extension cord allows you to move around without unplugging the microphone. A lapel clip helps to fix the microphone on your collar, convenient for you to record.We also throw in an extra storage bag so you can safely bring your mic wherever you go! ☪[3.5 MM TRRS COMPATIBLE JACK]:Simply plug the microphone into your MacBook, iPad, iPod, iPhone, Android or Windows smartphone,Plug and play, no additional plugs or batteries needed(iPhone7/7plus/8/8plus/X need an adapter). ☪[Extra 1 Adapters]:Extra two 4-pole 3.5mm adapters help to compatible with all 3.5mm audio ports. The 3-pole adapter is used for PC and cameras. ☪[SATISFACTION GUARANTEE]:We provide 12-month replacement or refund warranty. We will do our best to solve all your problems within 24hours. 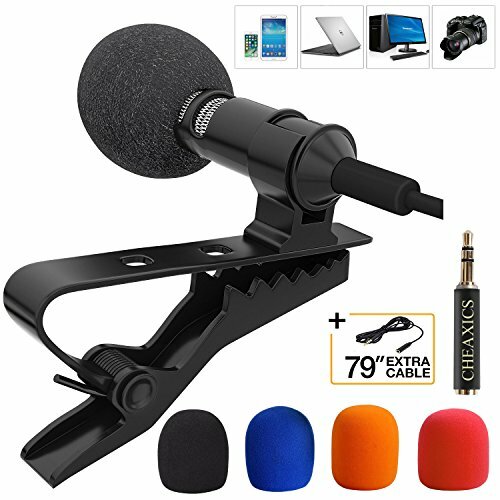 Easy to transport, great mic for phone!